After mixing up Hot Toddies for three weeks I’d like to share with you some life changing epiphanies I’ve had. Problem is, I haven’t had any. I’m still not head over heals in love with hot drinks, though the Hot Toddy definitely got me another baby step closer to liking them. Nothing earth moving there. I can’t share any incredible recipes that I’ve found, either. My main take away from my experiments is a really simple one. 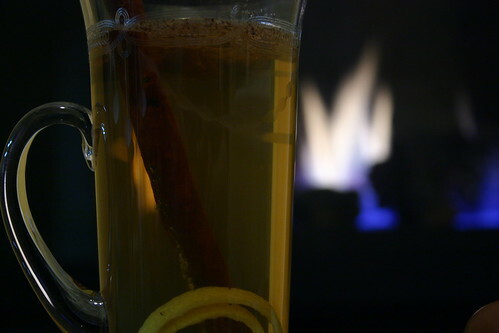 Next time it’s cold out and I’m looking for a nice relaxer I’m going to make myself a toddy, sit in front of the fire and decompress. I can hear a not small subset of you saying “well, duh”. As for the myriad toddy recipes out there, I again have some plain yet I hope good advice. You know that toddy recipe you’ve been mixing up for years and really love? That’s the one you should keep mixing up. Not because there aren’t possibly different, super interesting options out there. No, it’s not that at all. You should keep mixing that tried and true recipe because of all the relaxation and warming it’s brought you in the past. It’s those good memories that will make your recipe awesome every time you make it. Some tips? Okay, here you go. As for brown liquor, pick whatever you’re partial to at the time. I’ve tried brandy, rum and whiskey and can say they’re all good. They each have their own strengths and whichever you’re partial to in other cocktails will likely be the one you’ll enjoy most in a toddy. In the realm of spices the sky truly is the limit. That said, here are the ones I find particularly good: allspice (2-3 berries), cinnamon (a stick), cloves (3-4), nutmeg (a couple grates on top), and, as Greg suggested on my intro, a star anise adds nice flavor and looks really stunning in the glass. For sweetening I’d stick with honey. I contemplated maple syrup and agave nectar and while both would probably be pretty tasty I felt that their flavors might contrast the spices too much. Finally a bit of citrus is essential. I like both lemon and orange. The lemon is going to add a brighter note to the drink where orange will add a smoother, warmer note. Go with what you have on hand and make sure to zest them right over the drink to get those oils mixed in as well. So, there you have it. As I said at the start, no incredible new discoveries here. Just an introduction to a relaxing drink as we descend into the depths of winter. Stay warm my friends. Cocktail Hacker » Blog Archive » Hot Chocolate Time!